Saint Gemma is taught how Mary suffered in union with Jesus. Source for this information is from the Italian book "La Povera Gemma" written by Padre Enrico Zoffoli C.P. and published in 1957. The book is a 1014 page hagiography on the life of St Gemma. The webmaster would like to extend a heartfelt thank you to Mrs. Rita Dunn for translating it into English for this website. May God bless her for her efforts. The spiritual life of Gemma is inseparable from the meditation on the Motherhood of the Blessed Virgin, even more so then in many other souls. It could not be otherwise... the contrary, in fact, would be surprising. This [devotion to the Motherhood] stems from the spontaneous, warm, child-like temperament of a very young girl who became an orphan, stricken by grief that would prompt her to run through the steep road that brings one to the summit of Calvary. We hear again and again her voice more eloquent than any other soul in transmitting the tone of her relationship with her "Mom"; and the "reply" from Who destined Gemma to the same kind of martyrdom. 'Oh, if at least the Mom of Jesus would love me......if only I could become worthy of being called 'daughter'! I tell you, how many times this good Mom overlooked all my sins! How many times She was to me a loving Mother! Will She still be so when Jesus goes away? Is it true?....If Jesus leaves, I want my Mom. If Jesus does not want me and I have to live without Jesus, I want to be heard at least by Her;...I will not be able to be without my Mom. Oh, my Mother! I love you so..."169. "Here I am in the month of May! I think...of the many blessings that my Mom gave me in this first years of my life, and I am so ashamed...because I have not looked at that heart and that hand that would bring me so much kindness...yes, my dear dad ( Fr. Germano) -how many times in front of an image of my Mom I have confided in Her all the anxieties of my heart! And how many times my Mom comforted me! In all my afflictions I remember that I do not have my mom on earth but I do have a compassionate One in Heaven..." 170. In fact the Madonna appears to her, caresses her, kisses her and reprimands her, She wants a saint at all costs. She is also her only refuge: "You must make peace between Jesus and me " - exclaims Gemma during an ecstasy in which she was afraid to have lost the Divine Son - "Oh Mom, do not abandon me!.. Who will help me?...Do not go away.."
In another circumstance Gemma's spirit exults : "Oh dear dad (Fr. Germano) you should see how beautiful is that Mother!...Today there is a great feast for Her in Heaven. Jesus gives great glory to His and my Mom. See dear dad....She is so beautiful that words can not tell! The Eternal Father gave Her a crown made of His Holy Love..."
"How beautiful is Communion made with the Heavenly Mother! Dear dad, do you know what flight my heart feels in that precious moment? In only these words : ‘Oh my Mom, how happy I am in calling you so! My heart jumps as when I remember Jesus’. And She replied to me : ‘You are happy in calling me Mom and I exult in calling you daughter!’. “Let us reflect well dear dad on the Feast of the Heavenly Mother. Is it not the most beautiful day of the year? The soul on that day is consoled with serene peace and forgets the storms of this world.. Yes , Yes I have felt many times that the Feast of the Heavenly Mother is always for me a highest day of peace; a day of greater love and santification for all.."
However the heart of Gemma is at the foot of the Cross as she contemplates her Sorrowful Mother. Her Mother appears to her sorrowful and in tears, so the saint becomes conscious of her defects, and proclaims all her love. She learns this from Saint Gabriele who teaches her to compassionate the Blessed Mother [Saint Gabriel Possenti C.P. of our Lady of Sorrows –editor]: "She was the most afflicted of all women and She is comforted if a soul shows Her compassion. She has so many graces and She does not know to who She can give them. She finds no soul that asks Her, not a heart that begs Her". "a big cross", "very thick" to follow with the one of "her crucified Jesus". The following splendid meditation was suggested by the Mystery of the Incarnation. "This morning, after Holy Communion, I thought: ‘Oh, what a great sorrow must have been for the Madonna after the birth of Jesus when She thought that they were to crucify Him! What a heart ache! How many sighs, how many times She must have cried! However, She never complained. Poor Mother! 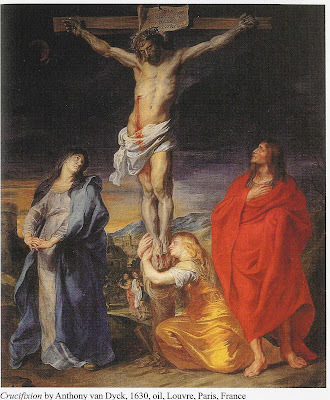 Then when She saw Him really crucified, that poor Mom was pierced by many arrows. I well know that when a person hurts the son in the presence of a mom or dad, the pain hurts the son and the parents. Therefore my Mom was crucified together with Jesus. And, She never complained..."
"Tell me Mom, what did you do when you saw Jesus crowned? What did You do, what did Your heart feel?....Ah! I understand it is a sorrow so great... what a difference between Your heart and mine!...It was a great sorrow...What will I do today here?..Jesus died, and You, my Mom, are crying. What will I do? To whom will I talk, who is with me?...I am not worthy, my Mom, that You remain with me...Why are you crying? What causes Your cry? If You cry because they offend Jesus, oh, my Mom, be consoled!.. I will do all I can so that He will not be anymore offended. I will do all I can so that they will leave Him be…..do not worry my Mother, I will sacrifice everything: words, thoughts, sacrifices, so that He will be less offended...Oh, wicked sinners stop crucifying Jesus, because at the same time you pierce His Mother." "Oh, my Mom, where are you? Again at the foot of the Cross of Jesus? ... What a sight You saw Mom when Jesus died!...When You placed Him in the tomb! And you could not be with Him anymore? How is it possible that You suffered so much because of me? How did You do it? Poor Jesus!.. Tell me how did You stand seeing Jesus being crucified to the Cross? My Mom… let me know the cross…. Who will understand You, oh Mother? I see that You continue to look at those wounds. How could I not have compassion on You? If I could.... Oh how great was Your pain!....You can not recognize Jesus. What did You do?.. .Oh God... Jesus is dead and Mom You are crying. Am I the only one that is so insensitive?.....I do not see anymore one sacrifice: I see two: one for Jesus and one for Mary! 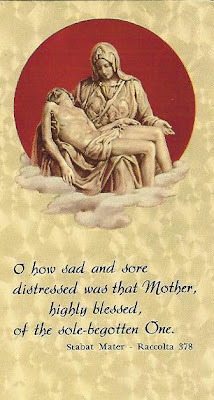 Oh Mother, if one could see You with Jesus, one would not be able to say who will be the first one to die: You or Jesus!" I do not know which one will be the first one to die. It is such a great sorrow , it is a spasm. Oh I do not see only one Victim any more but two. Why am I the only one so insensible? My Mom! Oh, how are you so able to embrace the Cross for all those souls that want to live without the cross? Oh my Mom! Oh my Jesus! Jesus, He pushes me to love the Cross; oh my Mom, but this cross... No, I will not refuse it, because if I refuse the Cross I refuse Jesus. Yes, I want to love it always. Is it possible not to love it?..." The number of excerpts from Gemma's letters here reported could seem tedious to the readers not prepared to appreciate the delicate vibrations of a mystic like Miss Galgani. The tone, so often very child-like, may not be suitable for everyone. This is not the reason of this study that is so uniquely directed towards the projection of her inner life, and the theme of a harmonious humility made of sighs towards the throne of God, that became more powerful then a hymn of Glory. We are justified in reporting these writings, because in the end they hand down to us her "response" to the invitation of her transfixed and dying Spouse. It was a reply that was lived with such a tenacity as to confer to her an incomparable spiritual physiognomy and aspect that has been recognized by the Holy Mother Church and those most enlightened souls that pray to her." Thank you for posting this Glenn! Believe me, I really enjoyed this article too!! If only we could see as St. Gemma did and joyfully accept our crosses for love of Jesus! Gemma took away my sharp pain while I was in Church. She is so real…everything she writes comes from her heart. Talk to her; she is there for you! Jesus Loves so incredibly and so does His Dad and The Holy Spirit!!! Thank you for your comment. It is wonderful to hear how St Gemma helped you with your sharp pains while you were praying in Church. How much help and how many graces we can receive from the intercession of the Saints if only we would ask them for their assistance! Thanks again and may God bless you and yours. Thank you for posting this… I found your blog through Spirit Daily within the last week and a half. I feel like she is following me around… and i hope I can learn from her in a better now that I am older and hopefully more mature. She is my confirmation patron, and while it was super clear at the time, that I must ask her to be my patron, it had never occurred to me that she CHOSE to be mine first. Reading all these articles, I am humbled to say the least. Thanks Glenn!! Thanks for yur kind comments. 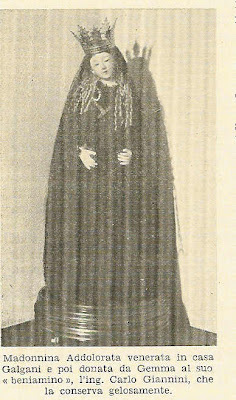 I am really glad to hear that you are enjoying this website and that you are inspired by St Gemma, your patron Saint. You mentioned that she chose you...believe me, that is so very true. I used to think that such things were just "coincidences". Now I realise more and more just how much God guides and inspires things; how He places desires in our hearts, and how He arranges our lives--always for our greater good, and the good of others. And, He arranged that St Gemma may be your special friend and advocate with Him, that she might lead you ever closer to Himself. thank you for the entire site. Thank you for your kind comment and most especially for your offering of prayers for my family and I at holy Mass this Sunday---I sincerely appreciate it!